1Department of Pathology, University College of Medical Sciences & GTB Hospital, Delhi, India. 2Department of Medicine, University College of Medical Sciences & GTB Hospital, Delhi, India. Received: May 30, 2016; Revised: July 5, 2016; Accepted: August 29, 2016; Published online: March 27, 2017. TO THE EDITOR: Acute lymphoblastic leukemia (ALL) is the most common childhood malignancy . Anemia, hepatosplenomegaly, and generalized lymphadenopathy are common findings in B-cell ALL . Although bone pain is a common symptom of being in almost 40% of cases, hypercalcemia and frank osteolytic lesions are very rare in ALL . Additionally, while about 7% of cases are diagnosed as the kidney involvement of ALL by intravenous pyelogram, it is uncommon that acute renal failure presents these primary manifestations . We report a rare case of B-ALL with prominent ostalgia and impaired kidney functions. A 14-year-old girl presented with a 3-month history of generalized body aches. The pain started initially in the lower back and then progressed to both legs and chest. There was no history of epistaxis, gum bleed, or bleeding from any mucosal site. On physical examination, the patient had generalized lymphadenopathy involving bilateral submandibular, posterior cervical, upper deep cervical, and superficial inguinal nodes each measuring less than 0.5 cm in diameter. Fine needle aspiration cytology (FNAC) was performed on the posterior cervical lymph node. There was localized tenderness over the chest and legs. The liver and spleen were palpable with stiffness and tenderness. Initial complete blood cell count (CBC) showed hemoglobin level of 8.5 g/dL, white blood cell (WBC) count of 9.4×109/L, and platelet count of 137×109/L. Peripheral blood smear examination showed normocytic normochromic red blood cells without abnormal cells or blasts, and WBC differential count of 72% neutrophils, 25% lymphocytes, 1% eosinophils, and 2% monocytes. 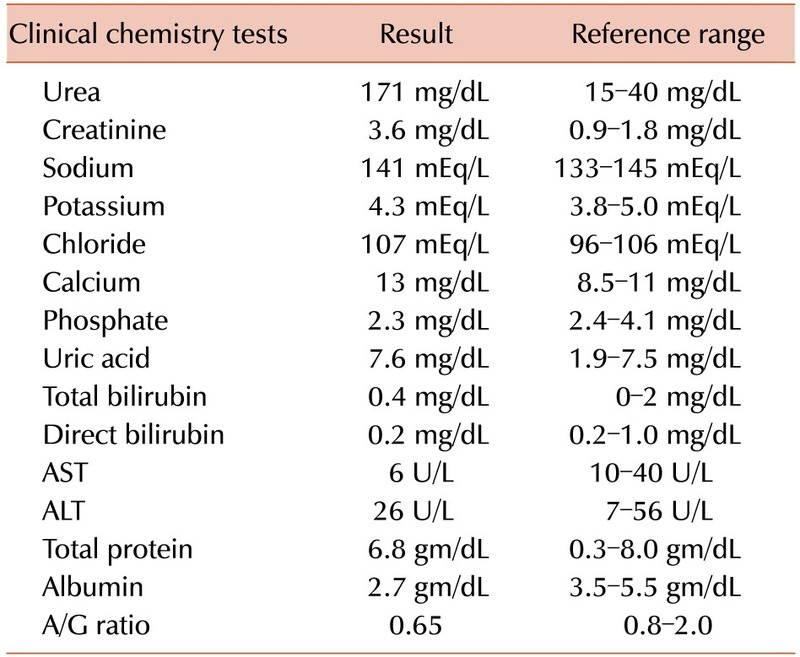 As shown in Table 1, the patient had marked elevated blood urea and serum creatinine with hypercalcemia and reversal of the albumin-globulin ratio. Radiographs of skeletal system was done which showed multifocal osteolytic lesions in skull, vertebral bodies, sacrum, pelvic bones, ribs and femur as well as loss of lumbar lordosis, collapsed T12 vertebral body with biconcave end plates along with mild wedging of L4 vertebra, end plate irregularities, and sclerosis at multiple levels (Fig. 1). Ultrasonography showed echogenicity for grade 1 renal parenchymal disease with mild-degree of hydronephrosis for both kidneys and scant amounts of ascites in the abdomen. Parathyroid hormone levels were at a normal level of 12.4 pg/mL. Serum protein electrophoresis was performed for confirming monoclonal gammopathy, but showed a normal pattern. Bone marrow aspirate examination showed diffuse infiltration of blasts, which were twice the size of lymphocytes with scant basophilic cytoplasm. Only occasional myeloid and erythroid precursors were seen (Fig. 1). 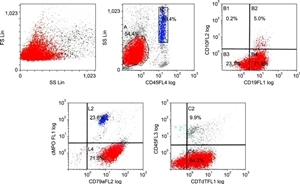 Flow cytometry identified the blasts population showing CD45 negative, CD19 positive, CD79a positive, and TdT positive which was consistent with a diagnosis of pre-B-cell ALL (Fig. 2). The modified BFM protocol was administered to the patient with sufficient hydration. The patient currently has been receiving consolidation phase 1 chemotherapy without remarkable complications. Bone pain is a one of the prominent symptom of acute lymphoblastic leukemia. Jonsson et al. reported that severe pain overshadowing other symptoms of ALL was present in 18% of the patients. On the other hand, hypercalcemia and frank osteolytic lesions are rarely found. Hypercalcemia arising from malignancy is a frequent complication in adults, but little has been recognized regarding that of children. In a previous study, hypercalcemia did not seem to affect the prognosis of patients with ALL . Hypercalcemia arising from malignancies is a result of increased bone resorption at metastatic bone lesion and humoral factors associated with calcium metabolism . In particular, parathyroid hormone-related peptide (PTHrP) is one of the most common causes of hypercalcemia in ALL. Shimonodan et al. revealed the fact that elevated PTHrPs in ALL come from lymphoblasts, associated with its frequent relapses and poor prognosis. Additionally, other leukemic blasts-producing cytokines including transforming growth factor-α, tumor necrosis factor, interleukin-1, and prostaglandin E2 may affect these phenomena . Although leukemic infiltration of the kidney is usually asymptomatic, it can lead to bilateral renal enlargement, acute kidney injury (AKI), or secondary hypertension . If recurrent hyperuricemia and AKI are persistent, it may be an early presentation of childhood leukemia and need to examination of bone marrow and kidney . In conclusion, hypercalcemia, multiple osteolytic lesions, and acute renal failure are uncommon in ALL, but can be initial manifestation of the diseases and may lead to early diagnosis of those. Therefore, clinicians keep in mind the possibility of ALL, when patient presented with unexplained hypercalcemia, multiple osteolytic lesions, and/or acute renal failure. (A) Bone marrow aspiration shows the presence of 64% blasts with high N/C ratio, scant cytoplasm, fine chromatin, and prominent nucleoli. (B) Radiographs of skull (C) pelvis (D) vertebrae showing multiple osteolytic lesions. The blasts population showed expression of CD19, TdT, and CD79a, consistent with B-cell acute lymphoblastic leukemia. Results of clinical chemistry tests. Young, JL, Miller, RW. Incidence of malignant tumors in U.S. children. J Pediatr, 1975;86;254-258. Pui, CH, Relling, MV, Downing, JR. Acute lymphoblastic leukemia. N Engl J Med, 2004;350;1535-1548. Jonsson, OG, Sartain, P, Ducore, JM, Buchanan, GR. Bone pain as an initial symptom of childhood acute lymphoblastic leukemia: association with nearly normal hematologic indexes. J Pediatr, 1990;117;233-237. McKay, C, Furman, WL. Hypercalcemia complicating childhood malignancies. Cancer, 1993;72;256-260. Hann, IM, Lees, PD, Palmer, MK, Gupta, S, Morris-Jones, PH. Renal size as a prognostic factor in childhood acute lymphoblastic leukemia. Cancer, 1981;48;207-209. Bhatia, NG, Sneha, LM, Selvan, SM, Scott, JJ. Acute renal failure as an initial manifestation of acute lymphoblastic leukemia. Indian J Nephrol, 2013;23;292-293. Hibi, S, Funaki, H, Ochiai-Kanai, R, et al. Hypercalcemia in children presenting with acute lymphoblastic leukemia. Int J Hematol, 1997;66;353-357. Rosol, TJ, Capen, CC. Mechanisms of cancer-induced hypercalcemia. Lab Invest, 1992;67;680-702. Shimonodan, H, Nagayama, J, Nagatoshi, Y, et al. Acute lymphocytic leukemia in adolescence with multiple osteolytic lesions and hypercalcemia mediated by lymphoblast-producing parathyroid hormone-related peptide: a case report and review of the literature. Pediatr Blood Cancer, 2005;45;333-339. Lokadasan, R, Prem, S, Koshy, SM, Jayasudha, AV. Hypercalcaemia with disseminated osteolytic lesions: a rare presentation of childhood acute lymphoblastic leukaemia. Ecancermedicalscience, 2015;9;542. Turkmen, K, Altintepe, L, Guney, I, et al. Uncontrolled hypertension secondary to leukemic cell infiltration of kidneys in a hemodialysis patient. Int J Nephrol Renovasc Dis, 2010;3;65-68. Larsen, G, Loghman-Adham, M. Acute renal failure with hyperuricemia as initial presentation of leukemia in children. J Pediatr Hematol Oncol, 1996;18;191-194.